India's biggest realty firm DLF is expecting Rs 200 crore rental income per year from its large luxury shopping mall in Noida to be launched early next year. NEW DELHI: India's biggest realty firm DLF is expecting Rs 200 crore rental income per year from its large luxury shopping mall in Noida to be launched early next year. 'DLF Mall of India' with 2 million sq ft of leasable area is being developed in Noida in the National Capital Region at an investment of Rs 1,100 crore and touted as one of the biggest in the country. DLF has leased about 90 per cent of the area and the mall is expected to be launched in February-March 2015, sources said, adding that more than 200 brands have signed so far. The company is expecting an annual rental income of Rs 200 crore from Mall of India in Noida, sources said. DLF's annual rental income from commercial properties, including offices and shopping malls, stood at Rs 1,950 crore last fiscal. It is targeting 8 per cent growth this financial year to Rs 2,100 crore, according to analyst presentation. Rental income could reach Rs 2,500 crore during 2015-16 fiscal on the back of normal 8-10 per cent growth plus additional Rs 200 crore coming from Noida mall, sources said. 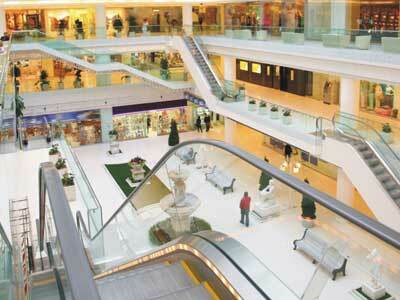 DLF currently has about 28 million sq ft of operational commercial area, of which about 2.5 million sq ft is retail. It has three operational malls in the national capital. The Noida shopping mall will have 7 DT star screens with a seating capacity of 2,000 audience and food court with over 1,200 seats. Sources said the company has formed an internal team to study the impact of e-commerce on the retail business and also suggest ways to deal with it. The report is expected in the next couple of months.Last week, DLF reported 29 per cent fall in consolidated net profit at Rs 127.77 crore in the first quarter of this fiscal compared with Rs 181.19 crore a year-ago. For the last fiscal, DLF had posted a net profit of Rs 646 crore over a turnover of Rs 9,790 crore.DLF has a total developable potential of 307 million sq ft, of which 57 million sq ft area is under construction. Top 5 GST rules that retailers must know!